In aerodynamics, wing loading is the total weight of an aircraft divided by the area of its wing. The stalling speed of an aircraft in straight, level flight is partly determined by its wing loading. An aircraft with a low wing loading has a larger wing area relative to its mass, as compared to an aircraft with a high wing loading. The faster an aircraft flies, the more lift can be produced by each unit of wing area, so a smaller wing can carry the same mass in level flight. Consequently, faster aircraft generally have higher wing loadings than slower aircraft. This increased wing loading also increases takeoff and landing distances. A higher wing loading also decreases maneuverability. The same constraints apply to winged biological organisms. Wing loading is a useful measure of the stalling speed of an aircraft. Wings generate lift owing to the motion of air around the wing. Larger wings move more air, so an aircraft with a large wing area relative to its mass (i.e., low wing loading) will have a lower stalling speed. Therefore, an aircraft with lower wing loading will be able to take off and land at a lower speed (or be able to take off with a greater load). It will also be able to turn at a greater rate. Some flyers rely on their muscle power to gain speed for takeoff over land or water. Ground nesting and water birds have to be able to run or paddle at their takeoff speed before they can take off. The same is true for a hang glider pilot, though they may get assistance from a downhill run. For all these, a low WS is critical, whereas passerines and cliff dwelling birds can get airborne with higher wing loadings. To turn, an aircraft must roll in the direction of the turn, increasing the aircraft's bank angle. Turning flight lowers the wing's lift component against gravity and hence causes a descent. To compensate, the lift force must be increased by increasing the angle of attack by use of up elevator deflection which increases drag. Turning can be described as 'climbing around a circle' (wing lift is diverted to turning the aircraft) so the increase in wing angle of attack creates even more drag. The tighter the turn radius attempted, the more drag induced, this requires that power (thrust) be added to overcome the drag. The maximum rate of turn possible for a given aircraft design is limited by its wing size and available engine power: the maximum turn the aircraft can achieve and hold is its sustained turn performance. As the bank angle increases so does the g-force applied to the aircraft, this having the effect of increasing the wing loading and also the stalling speed. This effect is also experienced during level pitching maneuvers. As stalling is due to wing loading and maximum lift coefficient at a given altitude and speed, this limits the turning radius due to maximum load factor. At Mach 0.85 and 0.7 lift coefficient, a wing loading of 50 lb/sq ft (240 kg/m2) can reach a structural limit of 7.33 g up to 15,000 feet and then decreases to 2.3 g at 40,000 feet while with a wing loading of 100 lb/sq ft (490 kg/m2) the load factor is twice smaller and barely reach 1g at 40,000 feet. Aircraft with low wing loadings tend to have superior sustained turn performance because they can generate more lift for a given quantity of engine thrust. The immediate bank angle an aircraft can achieve before drag seriously bleeds off airspeed is known as its instantaneous turn performance. 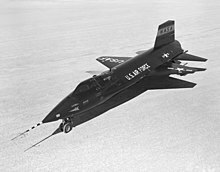 An aircraft with a small, highly loaded wing may have superior instantaneous turn performance, but poor sustained turn performance: it reacts quickly to control input, but its ability to sustain a tight turn is limited. A classic example is the F-104 Starfighter, which has a very small wing and high 723 kg/m2 (148 lb/sq ft) wing loading. At the opposite end of the spectrum was the large Convair B-36: its large wings resulted in a low 269 kg/m2 (55 lb/sq ft) wing loading that could make it sustain tighter turns at high altitude than contemporary jet fighters, while the slightly later Hawker Hunter had a similar wing loading of 344 kg/m2 (70 lb/sq ft). The Boeing 367-80 airliner prototype could be rolled at low altitudes with a wing loading of 387 kg/m2 (79 lb/sq ft) at maximum weight. The smaller the wing loading, the tighter the turn. Gliders designed to exploit thermals need a small turning circle in order to stay within the rising air column, and the same is true for soaring birds. Other birds, for example those that catch insects on the wing also need high maneuverability. All need low wing loadings. Wing loading also affects gust response, the degree to which the aircraft is affected by turbulence and variations in air density. A small wing has less area on which a gust can act, both of which serve to smooth the ride. For high-speed, low-level flight (such as a fast low-level bombing run in an attack aircraft), a small, thin, highly loaded wing is preferable: aircraft with a low wing loading are often subject to a rough, punishing ride in this flight regime. The F-15E Strike Eagle has a wing loading of 650 kg/m2 (excluding fuselage contributions to the effective area), whereas most delta wing aircraft (such as the Dassault Mirage III, for which WS = 387 kg/m2) tend to have large wings and low wing loadings. A further complication with wing loading is that it is difficult to substantially alter the wing area of an existing aircraft design (although modest improvements are possible). As aircraft are developed they are prone to "weight growth"—the addition of equipment and features that substantially increase the operating mass of the aircraft. An aircraft whose wing loading is moderate in its original design may end up with very high wing loading as new equipment is added. Although engines can be replaced or upgraded for additional thrust, the effects on turning and takeoff performance resulting from higher wing loading are not so easily reconciled. Modern gliders often use water ballast carried in the wings to increase wing loading when soaring conditions are strong. By increasing the wing loading the average speed achieved across country can be increased to take advantage of strong thermals. With a higher wing loading, a given lift-to-drag ratio is achieved at a higher airspeed than with a lower wing loading, and this allows a faster average speed across country. The ballast can be ejected overboard when conditions weaken to maximize glider cross-country speed in gliding competitions. A blended wing-fuselage design such as that found on the F-16 Fighting Falcon or MiG-29 Fulcrum helps to reduce wing loading; in such a design the fuselage generates aerodynamic lift, thus improving wing loading while maintaining high performance. Aircraft like the F-14 Tomcat and the Panavia Tornado employ variable-sweep wings. As their wing area varies in flight so does the wing loading (although this is not the only benefit). When the wing is in the forward position takeoff and landing performance is greatly improved. Like all aircraft flaps, Fowler flaps increase the camber and hence CL, lowering the landing speed. They also increase wing area, decreasing the wing loading, which further lowers the landing speed. ^ "Wing Loading Definition". Merriam Webster:. ^ Henk Tennekes (2009). The simple science of Flight: From Insects to Jumbo Jets. MIT Press. ISBN 9780262513135. , "Figure 2: The great flight diagram". ^ Gérard Florit (23 January 2016). "Ozone Buzz Z3". P@r@2000. ^ "Sport 2 / 2C". Wills Wing. ^ "Sporting Code Section 3: Gliding". Fédération Aéronautique Internationale. 12 October 2016. ^ Laurence K. Loftin, Jr. (1985). "Chapter 11 - Aircraft Maneuverability". Quest for Performance - The Evolution of Modern Aircraft. NASA Scientific and Technical Information Branch. Anderson, John D. Jnr. (1999). Aircraft Performance and Design. Cambridge: WCB/McGraw-Hill. ISBN 0-07-116010-8. Laurence K. Loftin, Jr. (1985). "Chapter 7:Design Trends - Stalling Speed, Wing Loading, and Maximum Lift Coefficient". Quest for Performance - The Evolution of Modern Aircraft. NASA Scientific and Technical Information Branch. Earl L. Poole (1938). "Weights and wing areas in North American birds" (PDF). The Auk.